To log in to TeleTracker Online, a user simply places a finger on the reader window, and the biometric fingerprint reader quickly and automatically captures and encrypts the fingerprint. It then sends the encrypted image to the DigitalPersona IDentity Engine for verification. DigitalPersona products utilize optical fingerprint scanning technology for superior image quality and product reliability. The combination of a U.are.U 4000 Fingerprint Reader or the U.are.U 4000B Reader with the DigitalPersona IDentity Engine produces an unmatched ability to recognize even the most difficult fingerprints. before connecting the biometric device to the computer. This driver supports both the U.are.U 4000 Sensor and the U.are.U 4000B Reader devices. Once the driver installation is complete, plug the device into the computer so windows can recognize the hardware. TeleTracker Online requires the hardware device to be recognized 1 time before a successful log in can be completed. 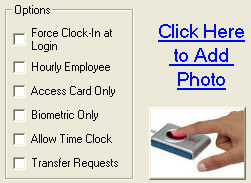 To configure your fingerprint for your log in click Master Files > Users. Open the desired User. 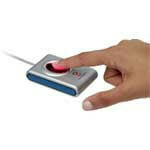 Click on the Biometric Finger Scanner picture to begin the setup process. Depending on the amount of use, the sensor window may need to be cleaned periodically. To clean the sensor window, apply the sticky side of a piece of adhesive cellophane tape on the window and peel it away. Under heavy usage, the window coating on some sensors may turn cloudy from the salt in perspiration. In this case, gently wipe the window with a cloth (not paper) dampened with a mild ammonia-based glass cleaner.